Pathology is a specialty that bridges basic medical science and clinical practice. In the era of personalised medicine, this specialty is facing unprecedented challenges. Some of these challenges are institution-specific, while many are shared worldwide at different magnitude. This review shares our team efforts in the past 5 years, 2012–2017, to revitalise a century-old academic pathology department in three aspects: administration, clinical service and academic development. The lessons learnt and insights gained from our experience may provide guidance to leaders in pathology or in other related specialties. The ‘Pathology Institute’, as part of the Royal Victoria Hospital complex, came into being in 1923 with building funds from the J.D. Rockefeller Foundation. In the 1960s, the Pathology Institute was expanded by the construction of the Lyman Duff Medical Sciences Building, located next to the Royal Victoria Hospital. In May 2015, the pathology laboratories of the Royal Victoria Hospital, Montreal General Hospital (MGH), Montreal Children’s Hospital and Montreal Chest Institute were centralised and relocated to the McGill University Health Center (MUHC) Glen Campus. The department provides service to a population of nearly two million people who receive clinical care in one of the McGill-affiliated hospitals.1–3 The department has an annual activity of about 200 000 surgical pathology samples, 170 000 cytology tests, 350 adult autopsies and 200 paediatric autopsies. On the administrative front, unclear management structure, lack of departmental policy, staff shortage due to suboptimal recruitment and retention, collegiality issues, a difficult financial situation and suboptimal communication were identified as the main issues. On the clinical front, workload increase and staffing shortage, inefficient workflow with significant backlogs, laboratory underfunding and repeated budget cuts imposed by the provincial government, inadequate specimen grossing due to deficient training and coordination of pathologists’ assistants and the lack of a robust quality assurance (QA) and risk management process were identified as the main issues. 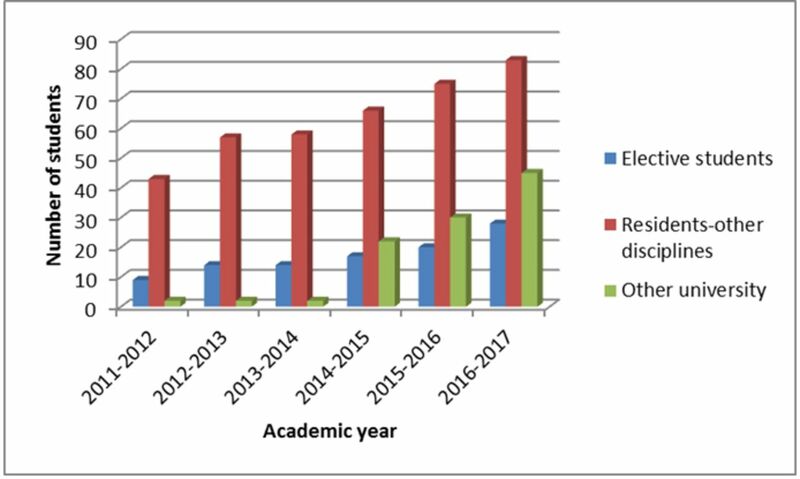 On the academic front, the diminishing graduate education programme, the sustainability of the residency-training programme, the lack of a funded clinical fellowship programme, the reduction of research capacity and output, the lack of structural and financial support for research activities were the major concerns. When we analysed the situation, most of the issues identified were at the system level rather than at the individual level because the quality of most staff members’ work was high. There were potential leaders or actual star performers in different areas, and most people wanted change and were willing to contribute. After the fact-finding exercise, we organised a 2-day departmental retreat. During that first retreat, the Chair delivered his assessment of the reality, moderated discussion on strategic solutions, on defining the department’s values and setting the direction based on the department’s shared vision. The clinical quality assurance director presented a gap analysis with the best practice guidelines. Education and research leaders presented a Strength-Weakness-Opportunity-Threat (SWOT) analysis of their respective domains. During that first retreat, we jointly crafted our vision, mission, 5-year goals and strategy and practical plans for the first year. We assigned teams and team leaders for each one of the strategic priorities identified. We also made plans to monitor our progress, address issues as they arose and modify our approaches when needed. This event brought medical scientific staff from different sites together and facilitated the development of cross-site subspecialty interest groups to jointly set practice standards, coordinate teaching activities and conduct research projects. Listening and asking the right questions. People on the ground know the real problems and can suggest solutions. Listening is also a powerful motivational tool. Carefully analysing the information gathered can discover the root cause of the problem and find potential solutions to the problem. Setting the stage for establishing a shared vision. Rebuilding a department will only work if the vision, goals and plans come from the entire team and everybody has played an integral role in the process. A pathology department must have a governing body with clear rules and responsibilities and a well-written departmental policy to set the norms and procedures. Working with departmental members, we revamped departmental policies to clearly outline the department’s expectations for pathologists regarding clinical service, teaching, research, attendance at meeting and vacation. The policy was communicated to all departmental members, including new recruits. We clarified the reporting structure and developed terms of reference for the key administrative positions in the department including the director of surgical pathology, director of quality assurance, directors of undergraduate, graduate and postgraduate education and director of research. Department leaders have a strategic focus on quality, efficiency, academic development, workload/staffing and external relations. Specialty group leaders are responsible for setting up practice standards, implementing QA processes, coordinating teaching and research activities and communicating with clinicians on issues related to their specialty. We used our practice plan, which is pooled clinical income, to provide a small stipend for some of the key administrative positions in the department. We established a departmental academic committee, a clinical operations committee, a quality assurance committee, a teaching committee and a research committee. All committees have clear terms of reference and hold regular meetings. We ensure that decisions made in those committee meetings are communicated to the staff in a timely, transparent fashion. We have incorporated policy review sessions in departmental meetings. Having an organisational chart clarifies the reporting structure and having well-documented terms of reference clarifies the roles and responsibilities for each position. To create an enabling environment, the chair should grant autonomy to the leaders and provide support but demand accountability to ensure they deliver the expected results. All stakeholders should be involved in drafting departmental policies. Once the policy is finalised, it must be communicated effectively in a multisite setting. People should be held accountable when rules are not followed. Regular staff meetings and retreats are good venues for discussing strategic directions and addressing department-wide issues and concerns. Recruitment and retention of the best people are critical for the success of any department. Once the right people are on the bus, it will go in the right direction.6 The challenges we faced were: (1) relatively higher workload and lower income than Canadian average,7 8 (2) pathologists’ fear/reluctance of diluting their income if new pathologist was recruited under the Quebec fee-for-service billing structure (3) unwillingness of some pathologists to share their specialty (4) lack of collegiality and academic support for newly recruited staff and (5) the complex and lengthy recruitment process, particularly for recruits coming from outside Canada. We streamlined the recruitment process. Working with the MGH and the Jewish General Hospital (JGH) foundations, we were able to secure start-up research funding for all newly-recruited pathologists and scientists in the amounts ranging from $30 000/year to $100 000/year for 3 years. Since 2013, we have recruited 18 pathologists (8 were replacement positions) and 4 PhD scientists into the department. Some of the new recruits have become the backbone of the department in research, education and clinical service. Finding the right people. Diagnostic skills, collegiality and academic potential are our primary considerations for recruitment. Provide support for the new recruits. In addition to providing start-up research funds, facilitating the establishment of research collaborations with established programme is an effective strategy for retention. Advocate, recognise and promote excellence. Some new recruits in our department were rapidly promoted to associate professors and were appointed into key leadership positions such as director of the residency training programme, director of surgical pathology and director of research. A healthy budget is critically important for accomplishing the academic mission of the department. With support from the dean, we redirected the use of over half a million Canadian dollars from the university each year for academic purposes. The funds were used for salary to support the recruitment of two research scientists, for undergraduate education as stipends for lectures and small group teaching, for graduate education as financial support for MSc and PhD students and as incentives for researchers to accept graduate students. In addition, an annual research competition was held to fund five internal research projects per year. Working with industry and the Rossy Cancer Network,9 we raised funds to support an annual departmental retreat and a monthly scientific lecture series. With the approval of staff pathologists at MUHC, we took 2% of pooled practice plan clinical income to support administrative stipends for subspecialty directors and the residency programme director, to support the academic expenses of our residents (eg, attending and presenting at conferences, attending review courses) and funded one clinical fellowship position per year at the MUHC. Starting from no financial support, our graduate programme raised over $500 000/year from different sources to sustain a graduate programme of over 30 graduate students. In addition to obtaining support from the practice plan, our resident training programme secured over $200 000 from the hospital education fund and the university postgraduate education fund. Working with the Cedars foundation and the Royal Victoria Hospital foundation, we were able to secure funds to purchase next generation sequencing (Miseq) equipment and the comparative genomic array (CGH) platform. Working with the JGH Foundation, we were able to raise 9 million Canadian dollars to build a cutting-edge McGill Molecular Pathology Center (MPC) with equipment including NanoString nCounter, two miSeq, two Ion GeneStudio S5 XL series, a cell culture facility platform associated with the MPC and to completely renovate the JGH Pathology laboratory. Thanks to an endowment of 3.6 million dollars from Dr Nunes Collins, a highly successful pathologist who began her career at McGill, the department was able to establish the Dr. Nunes Collins endowed Chair in pathology. Overall, the department raised 15.5 million dollars in addition to the half a million dollars per year from the university. The healthy financial outlook of the department helped us to expand our research capacity and advance our educational agenda. Assertive approach. We have aggressively reached out to potential donors in the community, alumni, foundations and industry, ensuring that they understand the critical role of pathologists in patient care and that every dollar they donate to pathology is used for the intended purpose of improving the lives of our patients. Innovative approaches. These included writing emails, letters, writing applications, sending Christmas cards, making presentations to the board of hospital foundations and through personal connections. We recently approached Chinese universities in a proposal to raise funds by offering teaching and collaborative research support. A culture of giving. Our pathologists were very generous in giving 2% of their clinical income to support resident education, a clinical fellowship programme and a small stipend for key leadership positions in the department. Workplace culture is a determining factor for the success of any organisation. A healthy culture in the workplace gives the employees a sense of unity and consideration towards each other, promotes better communication, less conflict, breeds loyalty and helps in recruitment and retention. Dysfunction can lead to high staff turnover, overall malaise and poor performance for the department at both the clinical and academic levels. The challenges facing our department were (1) staff fatigue and irritation due to high clinical workload (2) lack of collegiality between some medical and scientific staff and between some medical or scientific staff and support staff (3) high expectations for academic performance but without protected time or support for academic work (4) lack of transparency in the decision-making process and inadequate transmission of information and (5) positive behaviours were not acknowledged and there were no consequences for negative behaviours. To improve communication, several strategies were implemented including (1) a weekly management meeting with minutes circulated to all staff members; (2) a monthly staff meeting; (3) a quarterly departmental newsletter; (4) an annual departmental retreat and an annual research day; (5) a departmental web site with a news section. These measures have facilitated collaboration within and outside the department. In our department, the performance metrics were drafted by the academic committee, communicated to all staff members and approved by the associate dean of academic affairs. The metrics differ for scientific research faculty versus clinical pathologists. Among clinical pathologists, the expectations are different for clinician-scientists, clinician-educators and clinician-administrators. These metrics are sent to the staff with a self-evaluation form before the annual performance evaluation to allow staff members sufficient time for self-assessment. The Chair assigns a rating during a discussion with the employee to ensure that excellence is acknowledged, deficiencies addressed and career development plans are made in a positive environment. We also used performance review sessions to evaluate the Chair’s own performance and received many constructive comments on how to effectively manage the department. To promote an academic culture, we established a monthly scientific lecture series and an annual research competition. We award the best staff pathologist teachers, best residents and best resident teachers every year. We also established a Chair’s award for trainees who have platform presentations at international venues. These cultural changes have gradually improved staff members’ satisfaction at the workplace, facilitated better recruitment and retention and improved the academic productivity. Including departmental members in the decision-making process, encouraging their creativity and trusting their judgement improves job satisfaction and productivity. Pathologists’ resistance to change tends to be ‘passive-aggressive’ and reaching out to the resistors is imperative to understand their real concerns. Sometimes feedback from resistors can help initiate acceptance of change. The importance of communication cannot be overemphasised. Most of the issues we experienced were largely due to poor communication. Departmental social events such as a retreat and award ceremony can help create pride in the workplace and attract good people into the workforce. The quality of pathology service rests on each step of the workflow from sample request to delivery of the result. Poor understanding of the nature of pathology service and unrealistic demands by the general public and some healthcare administrators, workforce shortage, insufficient resources for QA (eg, IT support), the need to provide quality service to remote regions, subjectivity and the lack of a gold standard in the specialty are common problems facing many academic pathology departments around the world.13 As a multisite clinical department, one of our challenges is the lack of standardisation across hospital sites because each hospital site has a separate pathology laboratory with its own laboratory information system, its own standard operating procedures (SOPs) and QA manuals. Specimen grossing protocols differ between hospital sites and consequently, the number of tissue blocks submitted for the same type of specimen varies at the different locations. In our department, the quality assurance (QA) committee is chaired by the director of QA and composed of service chiefs at each hospital site, the director of the ancillary testing laboratory and the manager of technical operations. To improve quality, our QA committee conducted gap analysis between our departmental SOPs and the best practices of the Johns Hopkins Hospital, the Mayo Clinic and the Brigham and Women's Hospital. We standardised grossing templates for all specimens across all hospital sites. We updated our special stain and immunohistochemistry menu lists with on-slide controls. The pathologists work on a largely subspecialty-based practice model in which most subspecialties are covered by two or three pathologists and most pathologists cover two or three subspecialties. We have implemented synoptic reporting for all cancers and some non-neoplastic entities. Critical diagnoses are communicated verbally to treating physicians and documented on the report. All diagnoses that have a significant impact on clinical management are reviewed in ‘tumour boards’ and specialty clinical-pathology conferences. The Chair must advocate for the specialty and be actively involved in resource planning and the decision-making process within the hospital and the university to ensure the department has appropriate resources. Each pathology department should have a quality assurance committee responsible for developing standard policies and procedures across different hospital sites, managing incidents, implementing new quality improvement initiatives and laboratory accreditation. In a large centre, a subspecialty practice model with frequent clinical-pathological communication improves the accuracy and clinical relevance of pathological diagnoses. To improve efficiency, we centralised pathology laboratories from three hospital sites (Royal Victoria Hospital, Montreal General Hospital and Montreal Children’s Hospital) to the MUHC Glen campus and automated our platforms wherever possible such as for staining and immunohistochemistry.14 15 All molecular testing laboratories including molecular pathology, molecular haematology, molecular microbiology and cancer cytogenetics were centralised to a core molecular biology facility, which reduced the cost of repetitive instruments and reagents in isolated settings and facilitated a standardised process with improved quality. To appropriately use laboratory resources, we advised our pathologists and residents not to order unnecessary immunohistochemical stains and our pathologists’ assistants were taught not to submit unnecessary tissue blocks during specimen grossing.16 To remove non-value-added activity and to reduce variations, we designed the workflow of the MUHC pathology laboratory at the Glen site according to the Lean/Six Sigma concept.17 We adopted voice recognition, which essentially eliminated typing of gross descriptions and most of the pathology reports.18 We implemented Rapid On Site Evaluation (ROSE) for EBUS-FNA and for EUS-FNA cytology. Using a ‘pay for performance’ approach, we cleared all backlogs in autopsy and surgical pathology.19 Using the combination of centralisation, automation, lean and appropriate laboratory utilisation approaches, we were able to achieve over 20% budget savings in 3 years. Pathology teachers must be present at the drawing board during curriculum design to ensure that the content of pathology and pathophysiology teaching is sufficient and relevant to the understanding of the biology of disease. A department needs mechanisms to reward pathologists’ time and effort in undergraduate education. The more exposure to pathology, the more likely students will choose a career in pathology. The success of a graduate education programme is heavily linked to the number and quality of researchers in the department. Our Graduate Studies Programme was down to 8 students in 2012, and it was suggested by the faculty that we merge with larger programme such as Experimental Medicine or Oncology, thereby relinquishing our identity. To revitalise the pathology graduate programme, we (1) recruited four full-time PhD research scientists; (2) invited 12 prominent investigators doing disease-related research in other departments to become associate members in pathology so that they could supervise graduate students registered in our graduate studies programme; (3) recruited an experienced coordinator for the programme; (4) updated our departmental website to improve visibility and facilitate online applications; (5) secured over $100 000 in hard funding and (6) facilitated and supported our students’ applications for external funding from a variety of sources, both within Canada and from other countries. Significant increase in the number of graduate students (left) and funding for graduate students(right) in the past 5 years. Our graduate education committee led by the graduate programme director works with each graduate student and each supervisor to ensure that the students advance as expected in terms of their course credits, research projects and thesis work. We also provide advice and assistance to our students to ensure that they all have a productive career after graduation. None of our students have dropped out and all our graduates have succeeded in pursuing rewarding careers. Our students have won a variety of awards and scholarships during their graduate studies and their postgraduate careers predominantly include academic appointments, government agencies, medicine, administration, pharmaceutical and biotechnology industries. In addition to hiring new PhD scientists, having cross-appointed scientists as graduate student supervisors could increase the number of graduate students and provide a cross-disciplinary research environment. Having a designated administrator for graduate studies who can update the website, assess applications, coordinate courses and student evaluations is critical to the success of the programme. Graduate programme should include training in communication and career counselling to ensure students are well prepared for a successful career. McGill has the second largest anatomical pathology residency training programme in Canada with full accreditation by the Royal College. Our challenges were: (1) insufficient funding from the university to support a programme director; (2) insufficient funding for resident academic activities such as attending conferences and conducting research projects; (3) compliance with the new ‘competency-based residency training’ mandate set by the Royal College;25 (4) attract the best candidates into our programme and (5) ensure our residents are trained in the use of new technologies and laboratory management skills. Thanks to the financial support provided by MUHC pathologists, our department established funded clinical fellowship programme in Royal College Areas of Focused Competence in Cytopathology (AFC-cyto), gastrointestinal and liver pathology and in hematopathology. Five clinical fellows have graduated from our department since 2013. We officially launched the mentorship programme in the department in 2015 to guide career development for our residents and junior faculty members. Formal career lectures were given by the chair and mentoring was given by senior pathologists on ad hoc basis. Quality of teaching is an important parameter in our annual performance evaluation. Faculty members in our department are encouraged to attend courses to improve their teaching skills. We also implemented ‘how to teach’ lectures in our resident training programme, in parallel with the ‘how to do a scientific presentation’ training in our graduate programme. The chair must ensure that resources (funding, secretarial) are available to support the programme director and residents. Residents and trainees can be the driving force of innovation in postgraduate education. ‘Competency-based residency training’ requires us to have a completely new approach to training and evaluating our residents to ensure that they become competent pathologists after graduation. During the era of Maude Abbott and William Osler, the McGill Department of Pathology established an impressive collection of gross specimens in glass jars, initially for education and later for a museum. Thanks to the financial support provided by the MGH foundation, we have completely digitised the museum pathology specimens. Over the years, our department accumulated large numbers of glass slides and Kodachrome slides, which were poorly preserved in disorganised boxes stored at different locations. We organised a team of residents and hired three summer students to digitally scan these historical teaching materials and categorised them into organ systems. Between 2012 and 2018, the department produced three text books: ‘Gross Morphology of Common Human Disease’, ‘Pathology Review and Practice Guide’ and ‘Transplant Pathology’, all of which have become popular references for pathologists and trainees across the world.30–32 These new successful initiatives have enhanced the department’s position as a leader in pathology education. Review courses, update courses, CME conferences and textbooks can help to further enhance the leadership role of the department in pathology education and promote the visibility of the department on the national and international stage. Our department runs an annual McGill Cytopathology Review course with attendees from all over the world. Having a ‘teaching set’ from past collections facilitates learning for the trainees. Well-organised teaching materials can be published and promote the reputation of the department. This process also teaches our trainees and young pathologists the value of establishing their own ‘teaching collections’. The increase in service volume and complexity, the staff shortage, the emphasis on turnaround time and clinical efficiency and the fee-for-service system were major obstacles to pathologists conducting research. Difficulties in obtaining research funding (in 2017, the NIH grant success rate was <18.7%, while the CIHR success rate was 15%) were major obstacles for basic science research in the department.33 34 An academic pathology department has an important role in supporting tissue-based research for the local research community. To increase the research capacity, on the basic science front, we recruited to the department scientists that were worldwide leaders in molecular and cell biology, melanoma, ovarian cancer, brain cancer and colon cancer research. On the clinical front, we recruited to the department clinician-scientist in prostate cancer, pancreatic cancer, head and neck tumour, neurodegenerative disorder and lung cancer research. These recruits have laid the foundation for an academic department for the next few decades. Twelve associate members with wet research laboratories were invited to join the department of pathology. We established five core facilities: the histopathology research platform at the MUHC research institute, the pathology and molecular pathology research cores at the Lady Davis research institute, the pathology-imaging research core at the Duff Medical Building and the neuropathology research core with tumour banking facility at the Montreal Neurological Institute. To facilitate research activities within and outside the department, we established a statistics and project design course. We established a research fund to support pulling blocks and slides, statistical analysis, ethics applications, grant review, manuscript editing and project operating costs for pathologists. We recruited an administrator to facilitate the bioethics applications and the internal review of grant applications. We compiled the research projects and research interests of our medical scientific staff and made this information available to our trainees. To promote academic culture, we established a monthly scientific lecture series with international renowned external and internal speakers, which ensure our staff are updated with new developments in the field and also encourage collaboration at both the international and local levels. We designated $50K to fund a departmental annual research competition to support five small projects with one receiving $20K, two receiving $10K and two receiving $5K. We embed research into the residency training curriculum. All our residents are offered a biostatistics course as part of their training. All our residents are required to conduct at least one research project during their training and are encouraged to enrol into a graduate programme, that is, do a master’s or PhD degree during their residency. We hold an annual departmental research day to allow our trainees to present their work and celebrate their successes. We give out awards to our trainees who attend and present at national and international scientific conferences. In 2017, we officially established an Experimental Pathology Unit (EPU) in the department. We defined our signature research programme on diseases with high fatality such as ovarian cancer, brain tumours, asthma, pancreatic cancer and melanoma. Pathologists in our department are involved in the banking of tissue for their relevant subspecialty area. In our department, every clinical subspecialty has a ‘sandwich’ research structure, where the basic research scientists and their research laboratories serve as the ‘foundation’, pathologists as the ‘meat’ and graduate students, residents and fellows as the ‘top’. This ‘sandwich’ structure helps to promote subspecialty-based translational research through effective collaboration between pathologists and basic research scientists. To facilitate collaboration, using the Chair’s start-up fund, a research assistant was hired to pull out tissue blocks and cut blank slides to support researchers at McGill, within and outside the department of pathology. We also provided training to research assistants from different research laboratories to appropriately access tissue specimens. In addition, we supported tissue banking tumour specimens of breast, brain, liver and pancreas and so on. We incorporated the histopathology platform of the MUHC research institute with the MUHC Department of Pathology to support tissue-based research at McGill. Through supporting research and promoting collaborations with investigators in other departments, we effectively enhanced our own reputation and improved external relationships with the McGill research community. The department’s research funding increased from 2.5 million dollars/year to over 20 million dollars/year. In 5 years, we were able to raise over six million dollars to support academic activities of the department. These joint approaches have significantly increased the academic output of our department as demonstrated by a steady increase in high impact publications. In 2017, the department had 157 peer reviewed publications with a mean impact factor 6.06 compared with the mean impact factor of 3.78 in 2013. The McGill department of pathology has gradually regained its reputation as one of the leading research-intensive pathology departments in the world. Each department should consider defining its own signature research programme that will be the ‘brand’ of the department. Department needs to establish a system to support research, which include infrastructure (eg, core research facilities), process (eg, grant review, ethics approval), finance (such as start-up funds) and people (such as research assistants and an administrative coordinator). Department should capitalise on its specialty advantage so that it can be the hub of tumour banking and tissue-based research collaborations. In summary, we have shared our experience in revitalising an academic pathology department. Although positive experiences are shared in this article, we admittedly made a number of mistakes during our journey not herein elaborated on. We hope this exercise will inspire other leaders to share their perspectives in transforming their department. Only by doing so can we jointly improve our discipline, for the benefit of our trainees and our patients. Vision: clear, focused, idealistic and realistic, challenging and inspiring, shared preferred future. Plan: Specific (what, who, when), measurable, time-bound, accountable. Resources: infrastructure, finance, process, people. People: recruitment, retention, team building, mentoring/developing, performance appraisal. Culture: collegial, innovative, academic, discipline, fair, transparent, effective communication.
. 2018. Available: https://www.mcgill.ca/pathology/about/history [Accessed 7 Jul 2018].
. Brief history of medicine at McGill. 2018. Available: https://www.mcgill.ca/medicine/about/glance/history [Accessed 7Jul 2018].
. Canadian medical schools: two centuries of history. Montreal Harvest House, 1993.
. 2018. Available: http://www.ramq.gouv.qc.ca/SiteCollectionDocuments/professionnels/manuels/170-sle-specialistes/011_a_anatomo_patho_sle_spec.pdf [Accessed 30 Aug 2018].
. Berkley center for religion, peace, and world affairs, 2018.
. Good to Great: why some companies make the leap… and others don’t? 1st edn, 2001.
. Workload measurement guidelines. Canadian association of pathologists. 2014. Available: https://www.cap-acp.org/cmsUploads/CAP/File/CAP-ACP%202014%20Workload%20FINAL.pdf [Accessed 7 Jun 2018].
. 2018. Available: http://www.ramq.gouv.qc.ca/fr/professionnels/medecins-specialistes/facturation/anatomo-pathologie/Pages/anatomo-pathologie.aspx#charge/ [Accessed 1st Sep 2018].
. 2018. Available: https://www.mcgill.ca/rcr-rcn/ [Accessed 1st Sep 2018].
. Group dynamics. 5th edn. Boston, MA: Wadsworth Cengage Learning, 2009.
. The dynamics of conflict: a guide to engagement and intervention. 2nd ed. San Francisco, CA: Jossey-Bass, 2012.
. People and performance: the best of peter drucker on management. Routledge, 1995.
. Lean six sigma: combining six sigma quality with lean production speed 1st ed. McGraw-Hill Education 2002.
. Late autopsy reports: the calgary so lution. Can J Pathol 2011;3:26–30.
. Problem-based learning: an approach to medical education. Medical education. Volume 1. New York: Springer Publishing Company, 1980.
. Effectiveness of problem-based learning curricula: research and theory. Acad Med 2000;75:259–66.
. Committee on accreditation of canadian medical schools. 2018. Available: https://cacms-cafmc.ca/accreditation-documents/2016-2017/standards-and-elements [Accessed 6th Aug 2018].
. Guiding principles for graduate student supervision. Canadian Association of Graduate Studies, 2008.
. Implementation of the multiple mini interview for anatomical pathology resident selection –The McGill University experience. Montreal, QC, Canada: Canadian Association of Pathology meeting, 2015.
. Towards competency by design: establishing a ‘transition to pathology’ rotation for PGY1 residents. 20. Montreal, QC, Canada: Canadian association of pathology meeting, 2015: 24.
. Prediction of neoadjuvant treatment response in triple-negative breast cancer by evaluation of stromal tumor-infiltrating lymphocytes : one university-affiliated hospital experience. Donald W. Penner award for best poster by a resident. Montreal, QC, Canada: Canadian Association of Pathology meeting, June 20-24 2015.
. Pathology review and practice guide. 2nd edition. Edmonton: Brush Education Inc, 2017.
. Pathology of transplantation: a practical diagnostic approach. Switzerland: Springer International Publishing, 2016.
. Gross morphology of common diseases. Edmonton, Canada: Brush Education Inc. In Press. Contributors All authors contributed to the planning, conduct and reporting of the work described in the article. All authors contributed to the writing and approved the final version of the manuscript.